Dazzling performances and excitements are increasing day by day in the French Open 2018. Rafael Nadal and Maximilian Marterer from Men’s Tennis and Maria Sharapova and Sloane Stephens from Women’s Tennis made it to the next round. Result: Maximilian Marterer defeated Jurgen Zopp at the French Open by 6-2, 6-1, 6-4. World No.67, Maximilian Marterer, gave his best in the match against Jurgen Zopp and made it to the next round. The German, Maximilian, took a good start in the first set and won it by 6-2. Jurgen put up a good fight in the second set to beat Maximilian but his dreams were broken when the German star won the set by a big margin of 6-1. Now it was all down to the third set. Jurgen struggled hard and got 3 points but Maximilian didn’t make it easy for him and recovered the points in a very less time. At last, Maximilian won the set by 6-4 and booked his name into the round of 16. Maximilian Marterer will play against Rafael Nadal in the 4th round of the French Open 2018. 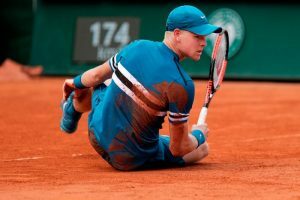 Result: Fabio Fognini defeated Kyle Edmund at the French Open 2018 by 6-3, 4-6, 3-6, 6-4, 6-4. Both the players played at their best against each other throughout the match. Although, Fabio won the first set but Kyle responded him by winning the next two sets with a good lead of 6-4, 6-3. It looked that Kyle could win the match but to his surprise, Fabio turned the tables in the fourth set and won it by 6-4. Now the fifth set was the decisive set for both the players. Fabio took the lead in the set but Kyle recovered back and the points were tied 4-4. But Fabio struck back and won the set by 6-4. Fabio Fognini’s match in the round of 16 is still to be decided. Result: Rafael Nadal defeated Richard Gasquet at the French Open 2018 by 6-3, 6-2, 6-2. Give a 👏 for @RafaelNadal. The king of the clay court, Rafael Nadal, won the match against the Frenchmen, Richard, and showed that he deserves to be the best player in Tennis. Richard struck more aces then Nadal but it didn’t matter as the Spaniard won all the sets with a good lead. Although, Nadal was in great form but Richard gave him a very tough time in all the sets. Especially, the third set which Rafael could have win from 5-0, Gasquet made it 5-2. At last, Nadal won the last game and won by 6-2. Nadal made his place in the round of 16. Maximilian Marterer will be facing Rafael Nadal in the 4th round of the French Open 2018. Result: Maria Sharapova defeated Karolina Pliskova by 6-2, 6-1 . An exquisite performance was seen on the clay court today of the Russian, Maria Sharapova, as she defeated Karolina in the first two sets and won the match. Karolina struggled in both the frames as Maria wasn’t giving any chance to stand against her. Although, Pliskova took the lead in both the sets but Maria ended them with her win. Maria Sharapova proceeded to the round of 16 of the French Open 2018 and her match is still to be decided. Result: Garbine Muguruza defeated Samantha Stosur by 6-0, 6-2 . What a fabulous and an absolute performance it was by the Spaniard-Venezuelan player, Garbine Muguruza, in the match against Samantha Stosur of Australia. Garbine didn’t let Samantha to lead her in the first set and won by 6-0. Samantha was hoping to make a comeback in the next set but Garbine was in pretty good form and won the second set too by 6-2. Garbine Muguruza qualified for the round of 16 in the French Open and she will be facing the Ukrainian star, Lesia Viktorivna Tsurenko, in her next match. Result: Sloane Stephens defeated Camila Giorgi by 4-6, 6-1, 8-6 . The American Sloane Stephens faced a tough opponent, Camila, in the round of 32. The first set was won by Camila who struck some good aces on the court today. However, Sloane mustered up courage and won the second set by a big lead of 6-1. It was a great start for Sloane as she came back in action after the loss of first set. Now it was all down to third set for both the players. The set started and Camila took the lead but Sloane recovered the points in a very less time and won the set by 8-6. Sloane Stephens booked her place in the round of 16 where she will be facing Anett Kontaveit of Estonia in the French Open 2018. Above were the highlights of the first half of the Men’s and Women’s Tennis. Do join allsportspk so that you can see the French Open 2018 day 8.